Taking a quick break from the Dragon Quilt, I finally spray basted the Orange-Stripy Quilt and have my area all ready to do some free-motion-quilting. However, I’m still not quite sure just how I’m going to quilt it yet. 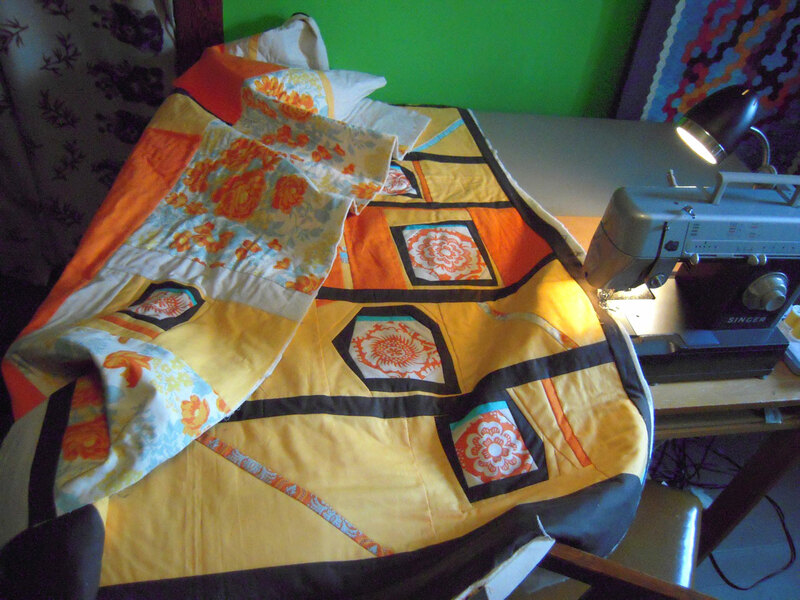 My favorite site for quilting inspiration is The Free Motion Quilting Project that Leah Day put together. I guess I better get over there and pick a motif. I’d love to have this finished for the PMQG meeting this Thursday! I also wanted to give a shout out to all the awesome Dads out there… yesterday was Father’s Day and every year I’m reminded of how lucky I am to have found someone who made the perfect daddy for my daughter. I just finished reading your blog from oldest to newest and enjoyed every post. I will be checking in often to see your progress on your dragon – WOW! I'm impressed. Such an ambitious project. You are so creative. I am thinking about hexes now. I love having something to do while watching TV in the evening. This may be it. Standing by…. I love this quilt. No suggestions on how to quilt it though. I am constantly undecided on that part of my own quilts.